Judy and Jack will be celebrating their marriage at the St Regis Monarch Beach in Dana Point this summer which we’re looking forward to photographing! 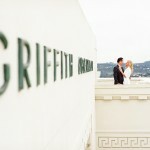 Angela and I had a wonderful time photographing their engagement session at Griffith Observatory in Los Angeles, CA. © 2012 David Savinski | Beverly Hills, New Mexico and New York Wedding Photographer|ProPhoto Photography Blog by NetRivet, Inc.